Airtime allows you to schedule audio files in a calendar timeline. 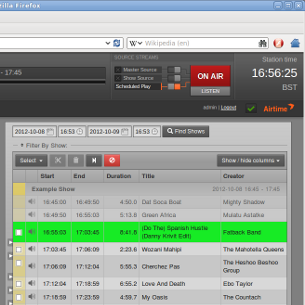 It is designed with radio stations in mind, as a free software replacement for similar commercial scheduling tools. 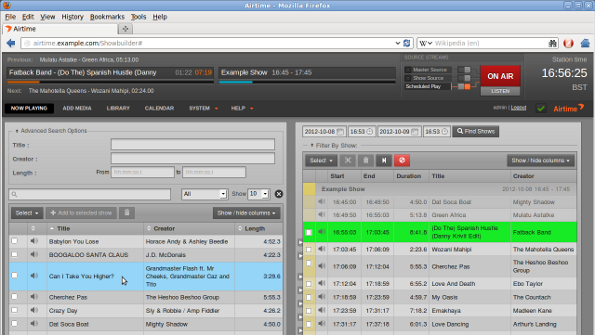 It has a scheduling calendar, smart playlists, archive management and a very stable output. You can also switch output to live streams coming in from remote DJs or journalists. Airtime is often used in a radio studio outputting to a radio transmitter. With internet access, it is also possible to upload and schedule shows remotely. Airtime can also stream audio to the internet, creating an internet radio station, and can display the current show info on your website. No full live mode. You still need to connect Airtime to Mixxx or similar to have a full studio replacement.